Use Animal Omega as you would your regular essential fatty acid (EFA) supplement. If this is your first time, take Animal Omega with a meal and you're good to go. Use a pack or two daily, as you need it. Generally, a single pack will do fine for most. Elite athletes can consider doubling up the serving. Animal Omega can be taken year round, without cycling off. 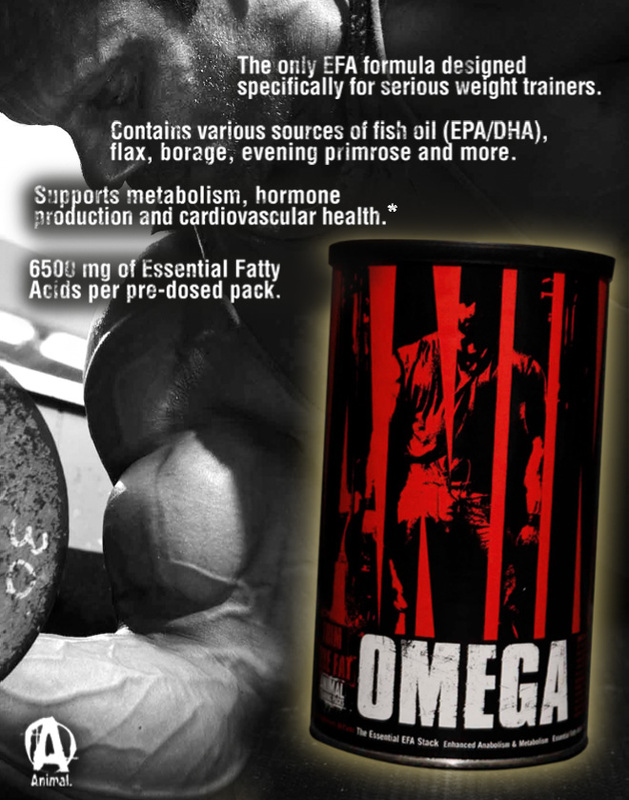 Like Animal Pak, Animal Flex and Animal Nitro, Omega is designed as a core or “foundational supplement”. As such, Omega stacks well with the rest of the foundational Animal supplements as well as with cycled products Stak and Animal M-Stak. A great cutting stack would be Animal Pak, Animal Cuts and Animal Omega. If you're looking to pack on lean muscle mass, add on quality size, or even cut down, ya gotta first take a look at your diet. No matter what your goals are, your quest for the ultimate physique begins and ends with the diet. In other words, the foods you eat. Tailoring the right meals will yield the right results in the gym. Food... Yeah, when you get down to the basics, it's quite simple-- to pack on mass, ya gotta take in more quality calories throughout the day. And vice versa, to cut down, ya gotta consume fewer calories, but also from quality sources. And of course keep up the lifting and cardio. Building a solid physique doesn't just stop once you leave the gym, it essentially begins and ends with your diet and nutrition which is a 24/7 job. When it comes to diets, for the most part, most opt for a low fat, moderate protein, moderate carbohydrate approach. "Trimming the fat" was seen as an integral part of living a healthy lifestyle and shedding the pounds. This is the old school approach, and one put forth by many champions. This was seen in the throughout the 80s and 90s with the rise of low-fat foods coming onto the market and getting heavily promoted in the news. But as years went on, obesity became more of an epidemic and caused the folks in the nutrition industry to look into it. People weren't eating fat much anymore, so what the heck? They shouldn't be getting fat. Right? Wrong. Recently it was found that low fat diets weren't all they were cracked up to be. A major study found, contradicting what had once been promoted as one of the cornerstones of a healthy lifestyle. Plus low fat diets so often translated to lowered levels of the hormones most critical to strength and muscle growth-obviously a huge disadvantage to serious iron athletes. Long story short, this science just further solidified what a number of nutritionists and doctors have been promoting for years-that there is an important role for fats in the diet and they shouldn't be shoved to the background, but instead brought into the limelight. In other words, "fats" in general aren't the problem. It's certain fats which create the issues. Other fats are, on the contrary, important. Over the years, researchers have found that there are numerous health benefits of certain fats, the essential fatty acids. In other words, it shouldn't be about trimming all the fats from the diet. Cutting back on saturated and trans fats, yeah. But you should actually start using or upping the intake of EFAs, on the other hand. EFAs are clinically suggested to exert positive effects in many areas, including supporting balanced insulin levels, thermogenesis, anabolism, hormone synthesis, prostaglandin function, immune function, repair of cellular membranes, enabling cells to obtain optimum nutrition and more. * For the bodybuilder, EFAs are vital for promoting metabolism, hormone production, cardiovascular health, peak performance, reducing exercise soreness and maximizing fat burning. * It's a wonder why they are so overlooked and underutilized by the population.